First released in 2017, AngerForce: Reloaded is a brilliant vertical screen-scrolling shoot ‘em up game developed by Screambox Studio, which takes inspiration from classic 90’s arcade games. Unlike the original release however, this 2019 rendition is specifically tailored for the Nintendo Switch, as it does support TATE mode, although you do have to enable it in-game when playing, and not just in a game menu. In terms of game story, the events of AngerForce: Reloaded unfold in the 19th century and the war you must endure, does not involve aliens from another world that are in the middle of invading the earth. What it does have instead, is enjoyable fly-and-shoot gameplay against a robot rebellion. What’s more, AngerForce: Reloaded ditches the go-to arcade aesthetic used by man, and instead opts for one that is more akin to a comic book art style, coupled with 2D technology, due to the game’s “free-form deformation technique.” It also happens to feature nifty little animated character sequences that are packing when it comes to detail, to the extent that there is a 3D-like effect to them. Quite simply, AngerForce is a stunningly beautiful shooter that is packaged rather well and it is a shooter that allows players to play as one of four characters (Samhill, Asimo, Shin and Echo.) It also features a small selection of bosses and stages and three game modes, which we’ll get into later. First up is the heroes of AngerForce. As far as the characters go, each one as their own stats for Attack and Health and they also have their own preferred weapon type, two special abilities to use for maximum damage and devastating bombs. Naturally, it’s nothing game-breaking, but let’s say for example you’re playing through the main campaign for the story and collectable items, when you do beat a level, players can use special points they have acquired to purchases upgrades that can be used on the second level. They can even choose to replenish their health, in case they got beaten up by the previous bod pretty badly and you can buy new maps. Another use for the points is using them for keeping your adventure going. Should all health be depleted on a given mission, the special points can also be used to buy another chance and in the event you don’t feel like coming back from the dead, after you’re game over, there is a new selection of abilities and upgrades to choose between. Unlike the abilities that pop up in between levels however, those effects are temporary, whereas the ones you see after dying, are permanent so in case you’re attempting to play through the game with a character you are completely useless with, you can always upgrade them and try again. Although I’m not too used to seeing features like this in a shmup, I must admit I did find it rather enjoyable, especially when you take into account that the ability system at play, does in fact give players something to keep coming back to, since levelling up each ability is not a five minute job. One negative with the campaign mode though, is the fact right from your first playthrough, you have no choice but to start on the easiest difficulty setting and must play multiple times to unlock the harder difficulty settings. Just remember though, which every new difficulty setting, the more intense gameplay you can experience. Sure, it’s the same old, same old in terms of gameplay (shoot everything in sight to rack up as many points as you can to set a record,) it doesn’t mean it’s any less fun this time around, since ZL is used for activating a Lowe Speed mode, with ZR being used for a High Speed mode that causes you to fly faster. For the sake of covering the other controls however, B is used to fire bombs, A is for your consecutive shoot and Y is used for single shooting and charging. For the players who wish to use their abilities (L for your red special ability and R for your yellow special ability,) charging is a necessity since abilities do cost energy and if you don’t have enough, you can’t release justified destruction. Additionally, when abilities are used, players can earn a higher Special Kill rank thanks to killing multiple enemies, this causing a combo. As for the actual movement, you need only to rely on the left joystick for that. Still, just in case players feel like the permanent abilities and upgrades aren’t enough to justify excessive gameplay, as I said before, there are plenty of collectibles, which can be acquired via playing, but you will need to act quickly to acquire them. As for the other two modes, there is an arcade mode, which is more of the same gameplay, only this time story is removed from the equation and a faster gameplay experience can be enjoyed instead and if you feel like you are going nowhere fast, in-game that is a practise mode that can help bring players up to scratch. One of AngerForce’s most notable features however, has to be the fact local co-op is supported and it can make things a lot more fun, or a lot harder depending on the defence between yours and your player 2’s prowess as a gamer. On the plus side though, the two of you can play through the main campaign together, so if there were instances where you were getting stuck on your own, a friend can be on hand to play with you and ensure the two of you can claim victory. However, in the event the power of two is not enough for you to collectively breeze through Veteran difficulty, it just means you need to work on your preferred pilots, get them the upgrades they need and then try again. Total victory might not be yours the first time around, but it soon can be. Nevertheless, the true icing on the cake has to be the soundtrack. From its guitar riffs to just how well it captures the heart and soul of the game and makes them go hand in hand with the chosen art style, is a pleasure to behold. Although I do have some issues. Other issues on the other hand, relate to some poor translations, a leaderboard that comes across as being boring and serving no real purpose and the lack of being able to flip the screen in options. It’s all well and good booting the game up and selecting a mode to play, but I would have preferred being able to go into options at any time to flip the screen, instead of waiting till I’m playing and then flipping the screen. Those issues aside however, AngerForce: Reloaded is a great game and one well worth getting excited about. 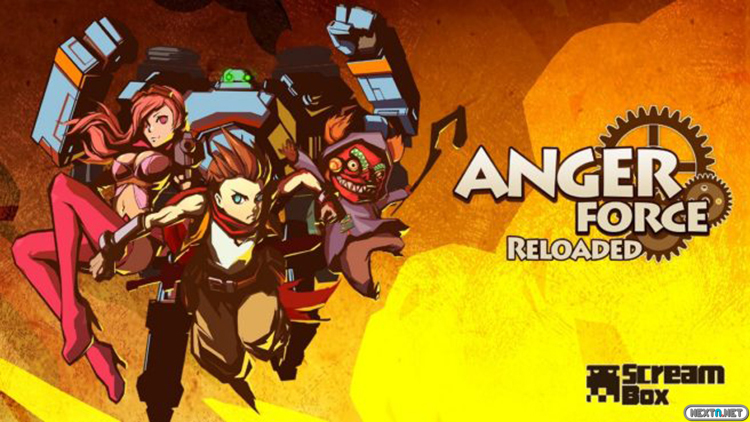 Instead of just being another 90’s inspired shmup that sports the classic retro look we know and love arcade games for, AngerForce: Reloaded is the perfect blend of modern ingenuity and old-school vertical scrolling gameplay. It’s got a rich design, has plenty of replay value and there’s just enough variety to warrant multiple playthroughs long before the game gets stale.